Regardless of what you need, The Salvation Army is here to guide your family to brighter future. Wellness is more than being free from illness, it is a dynamic process of change and growth. All Wellness Center programs aid in the active process of becoming aware of and making choices toward a healthy and fulfilling life. "We all have special gifts because He put the seed there, it's up to us as a family to nourish that seed and let it bloom. The Salvation Army is that family for me." A therapist is available to provide accessible, high quality mental health services for individuals, families, children and couples of all faiths. 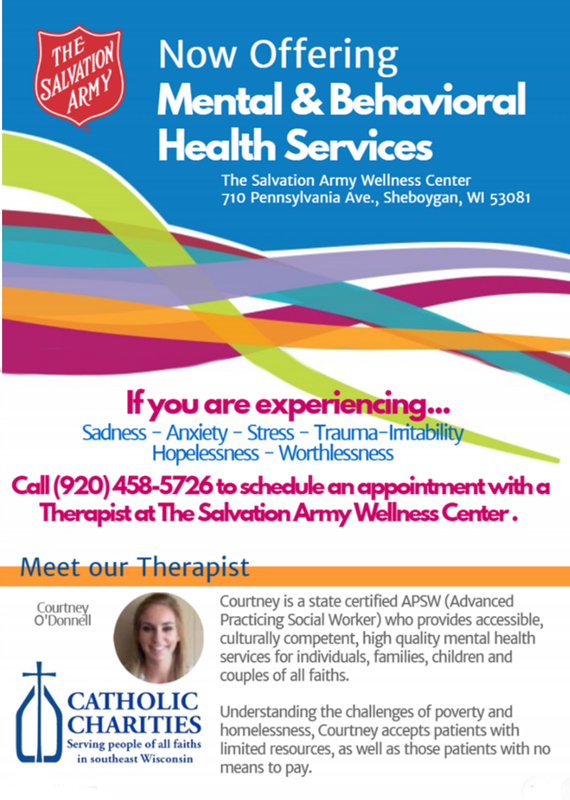 Call 920-458-5726 to schedule an appointment with a Therapist at The Salvation Army Wellness Center. Individualized services to families with children who desire to take action to break the cycle of crisis by helping them overcome challenges. Learn more at Pathway of Hope. Financial assistance available to eligible residents for prescription medication, eye glasses, eye exams, hearing aid and diabetic supplies. 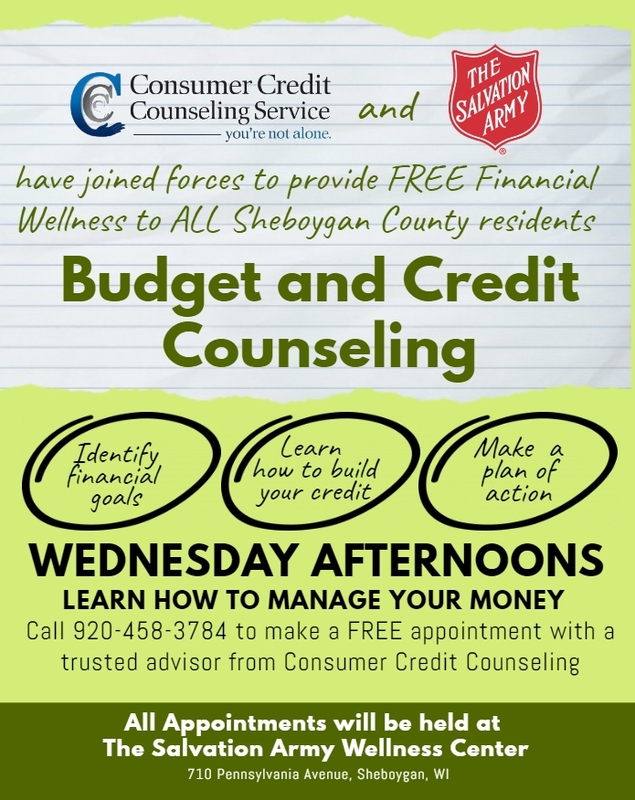 Call 920-458-3723 to learn more about the program. 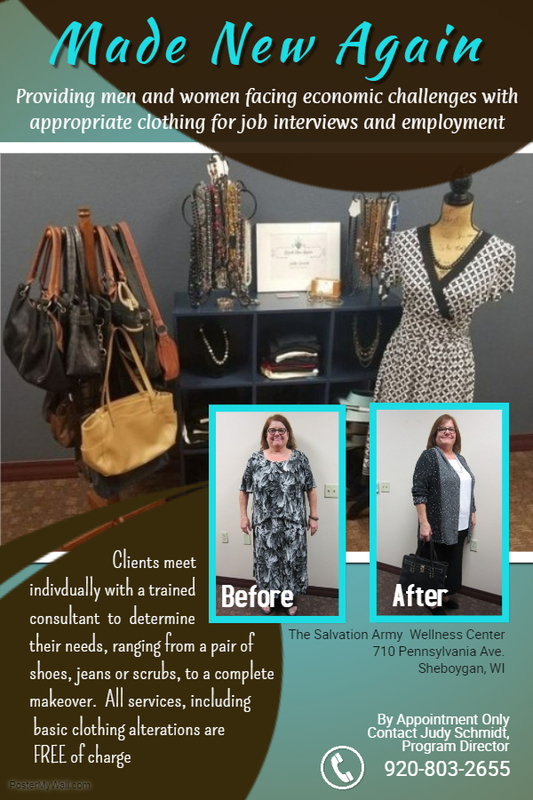 Providing men and women facing economic challenges with appropriate clothing for job interview and new employment. Contact Judith Schmidt, program director, at 920-803-2655 to schedule a consult at The Salvation Army Wellness Center.